With annual revenue crossing $200 million-mark InMobi has been one of the biggest players in the advertising world of Today. Naveen Tewari, founder and CEO of InMobi started his career with McKinsey & Company and performed the task of developing the go-to-market strategy for this huge Indian multinational, as it was to enter the telecom sector. Born in the year 1977, Naveen Tewari completed his graduation in Mechanical engineering from IIT- Kanpur in the year 2000. Later on he also did Masters in Business Administration from the HBS (Harvard Business School). Naveen received the highest honor, “Dean’s Award” at HBS for his excellent leadership qualities and contribution. In the year 2004-05 Naveen organized a trip to India for the students of HBS and made them understand the economical potential of the country, the culture and its people. Later on he started with McKinsey & Company and developed strategies for the company while it was planning to launch its brand in the Indian telecom sector. Naveen also worked with some of the top management of various tech companies and later he joined CRV (Charles River Ventures), one of the top venture capital firm focused on making investments on initial stages of software and communication businesses. Naveen designed is strategies on investment making decisions for India. He also worked in the Silicon Valley for a startup mobile VoIP. In 2007, Naveen founded a company focused on SMS-based search service which was named as mKhoj which then later on in the year 2009, converted to a mobile-device advertising firm and renamed as InMobi. InMobi is an Indian Multinational which is also the second largest ad networks other than Google. Recently they also left behind the Millenial Media which is one of the largest ad networks based in US and is also listed on the NYSE. Starting from the small start up mobile search called mKhoj at a small flat in Mumbai and wrapping up the idea as the idea didn’t seem working. And applying the Plan B approach of Tewari then came InMobi, a rebranded shape of mKhoj while on the way of building a mobile ad network. 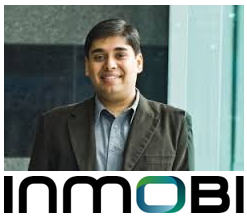 As the InMobi grew, it was soon realized by Tewari that being an Indian player is not worth as they witnessed several clients from South East Asia, Middle-east, and Africa approaching them if they can help them by any means. The headquarter being at Banglore, they can only penetrate into these markets up to a certain level but the greed was to get much deeper and to establish a local presence in these countries. Also with then estimated global ad market in 2011 according to the CII-PwC report was $3.3 billion and India has its contribution of mere $1.8 million and this was a signal for the team to move ahead. Luckily Tewari was successful to rope in $7.1 million from the marquee investors such as the Kleiner Perkins Caufield & Byers and Sherpalo Ventures. The Kleiner Perkins Caufield & Byers were the initial investors in Google, Netscape and Amazon, and they turned up for the InMobi with funds in the year 2008. With a lot of enthusiasm the team started their office in Jakarta, Indonesia and it worked as a milestone which then had led the company to have offices in 5 other countries. Instead of choosing the ‘hot’ trendy countries of US and UK, Tewari opted for the Asian markets initially and it worked amazingly. For a start up venture the emerging markets are the best option as there is lesser competition, lower expectation of the customers and a market size which can be smaller lesser in size when compared to giant, but are the most suitable for building up a strong base. Naveen Tewari always recommended entering into an Emerging Market, than to hit an established one as Emerging one has several advantages over the established one. In his words, most of the Indian companies not finding right market in India must try for the Middle East and South East Asia rather than approaching the western market. The US and UK giants do not look these countries as targets and the companies of China are happy with their own local market. Another advantage for Indian companies in these countries is the culture, and they can easily relate it with these countries. One of the key factors of the success on InMobi was hiring the locale leader as no one understands the domestic market as the locale does. In order to understand more deeply the markets abroad they needed to establish their offices their and for that they needed some of the qualified locals who helped them having their roots strong. People at all the countries wherever InMobi went have shown interest in joining it because of the global work culture of InMobi inspiring them to be a part of its family. With the experience of working with vQube, a global mobile VoIP, Tewari had enough learnt of the work culture across the countries and the usage of the latest technologies for the purpose of communication. The offices of InMobi have only two landlines and they use to communicate through every possible digital medium such as Skype and other instant messaging tools. Hiring best of the best leaders from various countries to handle the local operation worked effectively in the success story of InMobi. Most of the employees are ex-Google employees and have enough to be told about them. They just know how to fix things and then they do it.